NHK has announced new cast members for Kyoukai no Rinne (TV) 3rd Season, which will begin airing on April 8. 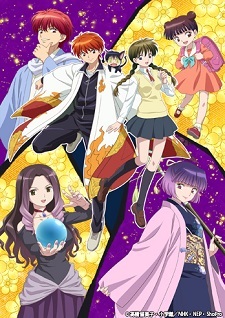 The time to start has also pushed back a bit, which will be at 5:35 p.m. instead of 5:30 p.m.
Kyoukai no Rinne started its serialization in Shounen Sunday in April 2009 and is written by Rumiko Takahashi. The manga has released 34 volumes in print, with the latest released on December 16, 2016. Viz Media has released the manga in English under the title RIN-NE since October 20, 2009. The manga first received an anime CM adaptation in October 2009, and then later received its first TV anime series from April 2015 to September 2015. Its second season aired from April 2016 to September 2016. Sentai Filmworks licensed both seasons. @Mel_Tan Nothing has been announced so far regarding to a 4th season. anyone knows if there's gonna be a 4th season? Does it get better in second season? I completed the first but kind of "out of duty". I thought the second season was better executed than the first. Less boring/mediocre and the pacing felt better. on how long the manga goes we may get another fully adapted Takahashi manga. I'm not so sure that they aren't just skipping around and adapting various chapters out of order. It's about the same except the scumbag dad gag isn't overused. I see... maybe in another life. Spring line-up for this year is looking great. And more of Rumiko's work is always welcomed! Is this really popular in Japan or something? First season was complete trash, and I'm saying that unironically. Never even thought this would get a season 2, but a 3rd season?! Wow I never expected a season 2, but there's now gonna be a season 3. It has quite good TV ratings so honestly wouldnt be surprised if they will go and do a full adaptation since they got anyway allot of material to work with.